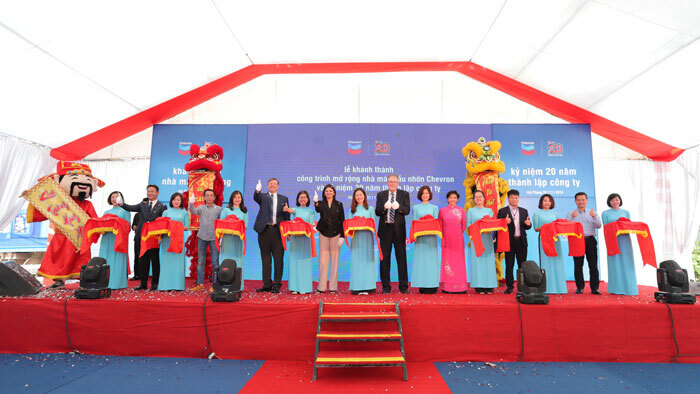 Chevron Lubricants Vietnam, formerly Caltex Vietnam, celebrated its 20th anniversary on 20 November 2018 with the completion of a major lube blending plant expansion project in Hai Phong. The expanded plant is now more than double its previous capacity, and is expected to contribute to growth in the Vietnam market. This USD5 million project is set to ensure Chevron Lubricants Vietnam keeps pace with the country’s continued economic development over the next decade. Since the inception of the Hai Phong plant at Chevron Lubricants Vietnam in 1999, the market has seen great demand with production capacity growing by more than 100 times. With a goal of aligning to increased demand, the plant enhancements included upgraded manufacturing capability for premium lubricants and an array of new storage tanks and warehouse upgrades with enhanced product integrity systems. “We are excited to celebrate 20 years in this key lubricants market. Our Hai Phong plant’s expanded capacity plays a significant role in growing Chevron’s Asia Pacific plant network, primarily serving the growing domestic needs in Vietnam while in a strategic position to support export markets in the future,” said Rochna Kaul, Chevron’s general manager for Asia-Pakistan Lubricants. Chevron Lubricants Vietnam began operations in 1998 marketing a handful of commercial products imported from the Singapore plant or toll-blended locally while facing stiff competition from established suppliers. A key element of the winning formula for the Vietnam team has been upgrading and diversifying product offerings in line with transportation trends. For example, the specialized products introduced for the country’s explosive motorcycle-scooter market sold more than 3.2 million units in 2017. Today, Chevron Lubricants Vietnam has expanded from three to seven products for cycles and scooters including full and semi-synthetic engine oils with proprietary anti-wear technology. Recent introductions include Delo 400 MGX which meets the new Euro 4 exhaust emission standards established last year and a new Techron (TCP-MC) fuel additive.